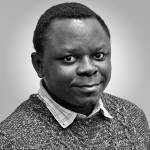 Agossou Gadedjisso-Tossou is a PhD researcher in the Water Resources Management Unit at UNU-FLORES. His research at UNU-FLORES focuses on Future Irrigation Water Demand in Agriculture in West Africa. Before joining UNU-FLORES, Agossou was a Research Assistant at the Research Laboratory on Poverty and Sustainable Food Security (LARPSAD) at Université de Lomé in Togo. At LARPSAD he worked on various projects with institutions such as Deutsche Gesellschaft für Internationale Zusammenarbeit (GIZ), Islamic Development Bank (IDB), the Economic Community of West African States (ECOWAS), African Union (AU), and Ministries of Agriculture and Environment and Forest Resources of Togo, among others. Agossou received his engineering diploma in Agricultural Economics from the Université de Lomé and his Master of Science degree in Climate Change and Human Security with a focus on Vulnerability Analysis from the West African Science Service Center on Climate Change and Adapted Land Use (WASCAL) and Université de Lomé.